Petworth neighborhood joint Little Coco’s may be vying for a “best happy hour” title with its new deal: all-you-can-eat-and-drink for $23 per person. 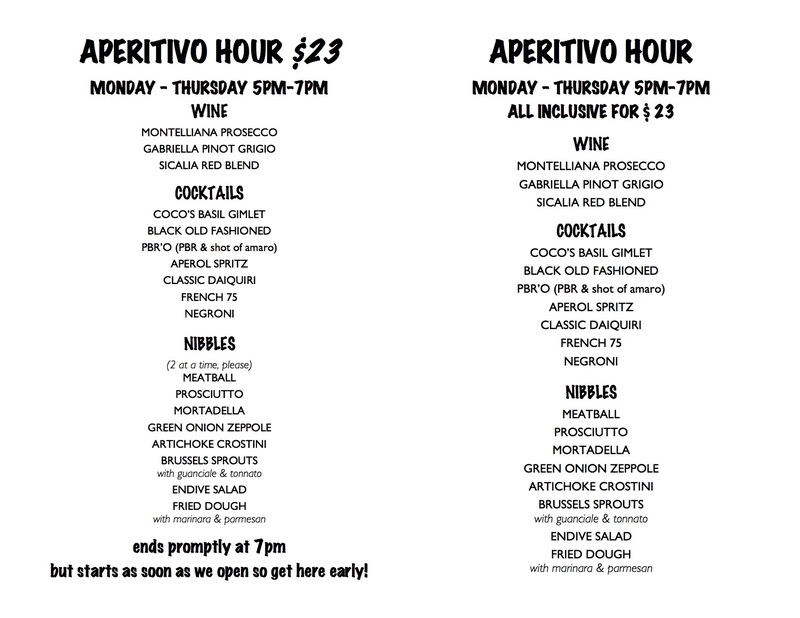 Co-owner Jackie Greenbaum (Quarry House Tavern, Bar Charley, El Chucho) says the two-hour special, offered from 5 to 7 PM, Monday through Thursday, is inspired by the Italian “apertivo hour” tradition where drinks are accompanied by free snacks. And even better: it’s offered throughout the entire first floor bar and dining room. Chef Adam Harvey created a lineup of booze-friendly nibbles like meatballs, charcuterie, and fried dough with marinara for dunking—a nod to his fried pizza. To drink, there’s an impressive breadth of options ranging high (negronis, Aperol spritzes) to low (PBR’O a.k.a. a can of PBR and shot of amaro). Patrons are encouraged to come right at 5 PM to take advantage of the bottomless deal (and, we assume, stake out space). Little Coco’s. 3907 14th St., NW. Happy hour offered Monday through Thursday, 5 to 7 PM.